Solacoat is a revolutionary Non-Toxic Environmentally safe and friendlywater-based acrylic coating that contains a unique membrane additive, which reflects up to 84.9% of the sun’s solar rays from Metal,Concrete and most other construction materials,therebysignificantly reducing cooling electricity bills for air-conditioned facilities and provides significant internal temperature drop for non-airconditioned structures. Sunlight is white light a mixture of all colours of the spectrum. There are two primary components of sunlight that reaches our earth surface, visible and infrared. Visible light is what we see as colour and makes up roughly 46% of the spectrum yet more than half of the spectrum consists of infrared light invisible and until now unconsidered. Infrared light, because it’s invisible, doesn’t affect colour but it does have a great effect on the rate and extent of heat build up in homes and commercial properties. Absorbed infrared is transferred into heat warming the surface and surrounding areas. Pastel colours are good reflectors of this light but conventional dark colours absorb it causing high heat build up. Solacoat Heat Reflective coatings work by reflecting infrared light. 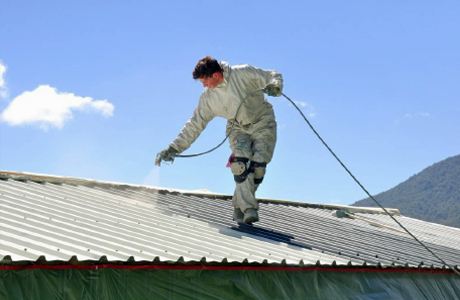 Reduces heat from getting in with a reputable heat reflective and cost effective coating. Solacoat requires 1 x 60 micron thickness wet of Primer and 2 x 60 micron thickness wet topcoat applied to the surface. Solacoat Cream Solar Reflectance of 84.9% reflects the heat back to theatmosphere.The other 15.1% of heat that pass through the coating is then released by Solacoat's high thermal emittance value of 0.88. Solacoat Heat Reflective pastel work by reflecting both the, visible and infrared light.